It was quite by chance that we came to visit Waterkloof Wine Estate located above Somerset West, an hour’s drive east of Cape Town. I had not heard of the wine farm until several years ago when we received a comment on one of our blog posts about South African wines. 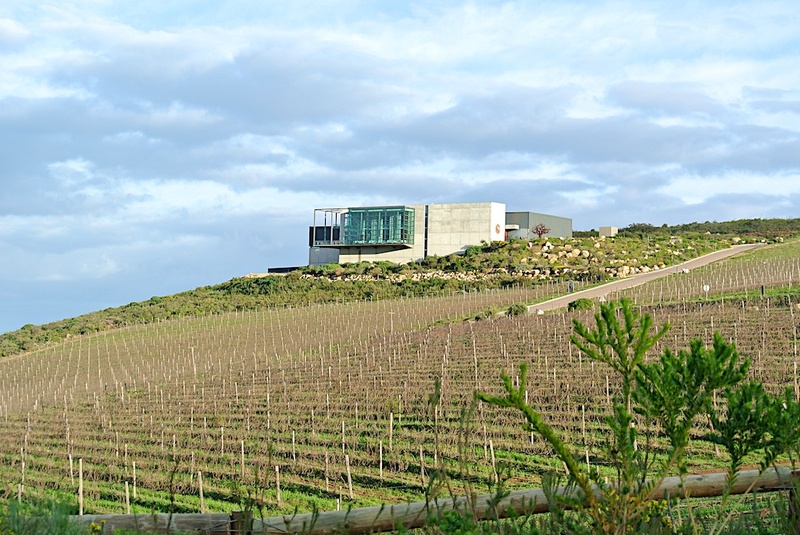 Louis Boutinot, Waterkloof Export Manager and son of the farm’s owner Paul, commented on the post and suggested we consider visiting Waterkloof Wine Estate should we ever visit South Africa. I did a bit of research and discovered that not only are the vineyards farmed biodynamically, they even use horses in the vineyard. Aside from the spectacular natural beauty and the beauty of the winery building, the biodynamic farming practices were a serious draw for me. I knew immediately I wanted to visit the wine farm during our visit to Cape Town. Our tour of Waterkloof Wine Estate began in earnest as farm manager Christiaan Loots led us on a short walk up the Schapenberg — sheep mountain. A stiff wind blew in from False Bay, one strong enough to knock you off balance if you didn’t keep your feet firmly planted on the granitic soil. As we stood in the midst of native fynbos vegetation, a collection of surprisingly diverse, shrubby plants whose species on the farm number in the hundreds, Christiaan explained this diverse fynbos vegetation is typical native vegetation of the Cape. “This is what the Cape should look like.” Christiaan told us. There is an effort underway to connect pockets of natural fynbos to each other all around the cape in order to preserve its diversity and the animal life it supports. Though I could’t see them, I heard many birds singing from within the fynbos. Fynbos diversity on the farm is a result of an early project clearing the land of invasive tree species, followed by burning. This harsh treatment brought the native fynbos back to into balance, taking advantage of the massive natural seed bank it harbors. Some of the cleared land became vineyards, but a large portion is now covered in native fynbos vegetation and will remain so. Clearly Christiaan feels a sense of responsibility and pride in preserving this native vegetation. This beautiful, natural area is now used to host hikes and horseback rides of the area — a natural pairing with Waterkloof wines! From this vantage point at 315 meters above sea level we were able to enjoy the spectacular view of False Bay, only 5 km in the distance. Christiaan pointed out several crosses carved into granite rocks in the area. The crosses identify the locations used by early Dutch East India Company cartographers as they made the original maps of the area. Clearly we were not the first to appreciate the view from this vantage point. As we stood admiring the Waterkloof vineyards and the ocean views, Christiaan told us that winery owner Paul Boutinot searched for 10 years, world wide, before finding this location for his winery. The Brit had a very specific site in mind, one that would lend itself to biodynamic farming practices and hold the potential to produce world-class wines. In 2004 Boutinot purchased the 120 hectare estate. The road we followed earlier to reach the winery building traces a ravine with hills on either side and took us past farm buildings and rows of mulch and compost. At one point we were even behind a flock of sheep, our first indication of just how unique this farm visit would be. The ravine eventually opened into a wide bowl and the road curved to the left following the contour of the hills, delivering us to the spectacular Waterkloof Wine Estate building. This modern glass and concrete building houses the offices, wine cellar, cellar door (tasting room) and Waterkloof’s award-winning restaurant. The almost constant wind figures prominently in what makes this site so perfect. 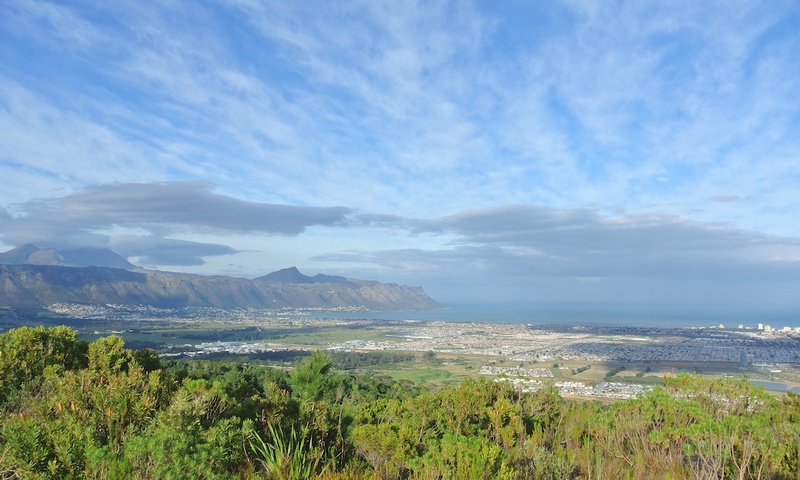 The cool sea breezes keep temperatures significantly cooler than other regions of Stellenbosch, extending the growing season and preserving natural acidity in the grapes. The wind also deters pests and keeps vine shoot growth in check. There is little need for shoot thinning and care must be taken to trellis the vines early in the growing season to avoid shoot damage. When talking about trellising, Christiaan was quick to mention some of the older plantings of Chenin Blanc and Mourvèdre on the farm are bush vines, which he much prefers. The circular growth pattern, with even exposure to sunlight, even ripening and uptake of soil nutrients are all benefits of bush vines. Not all grape varieties can be successfully trained in this manner, so some must be trellised. In addition, the hillside vineyards have a southern exposure, which in the Southern Hemisphere is cooler than a northern exposure. The fynbos restoration project has served to insulate Waterkloof’s vineyards from those nearby. The fynbos diversity brings with it a large number of predator insects that in turn keep vineyard pests under control naturally. Since the fynbos restoration, Christiaan has seen a significant decrease in mealy bug infestations in the vineyard. The rocky, granitic soils that characterize the vineyards provide good drainage and are highly prized. The 20 hectares of vineyards that were planted prior to the 2004 purchase had been farmed conventionally. Christiaan found a vineyard with seriously compacted soils, containing little or no organic matter, and significant pest infestations. The biodynamic practices that Christiaan has used at Waterkloof for the past 10 years have completely transformed the vineyards, which he demonstrated as we walked into a vineyard block of Sauvignon Blanc. What we saw was a vineyard filled with a wide variety of ground cover that included clover (a Nitrogen binder) and dandelions which accumulate silica. The soil was very soft to walk on. Christiaan was easily able to grab a hand full of dirt; it was light and almost fluffy. And the soil was full of tiny roots from the diverse ground cover. When we asked Christiaan about his experience with biodynamic farming practices, he said he knew nothing about it when he joined Waterkloof. At the very beginning he and Paul traveled to biodynamic vineyards in France so he could see the process in action. He read many books and talked to other biodynamic farmers. Jean Malberbe, a local biodynamics pioneer became his mentor. Christiaan admits to being skeptical of the biodynamic process initially, but the results have made him a believer. Most recently the area was hit by a massive storm in November 2013. Other farms in the area had significant mildew issues and as a result, decreased production in 2014. 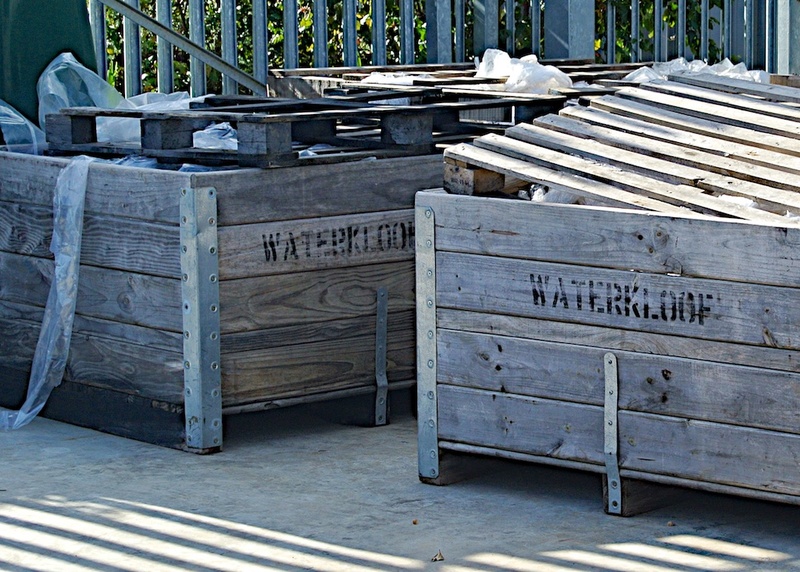 For the 2014 vintage, Waterkloof increased production as much as one ton per block. Christiaan attributes this increase in production to the improved immunity of the vines, which is directly derived from soil immunity. So, how are soil and vine immunity improved? It’s a process, and every step in the process is connected to the next. Christiaan uses only compost and compost teas (an extract of compost steeped in water) prepared on the farm to fertilize the vines. No synthetic fertilizer is used. Christiaan described biodynamics as “sustainable cost-effective farming”, indicating he uses every resource the farm provides him. When Waterkloof began it’s biodynamic practices, Christiaan had four tractors on the farm and a big diesel fuel bill. Now, to farm the vineyard, the vineyard workers use horses. Seven Percheron horses are used to farm the vineyards by block, each horse and worker team is responsible for 8 hectares. The teams plow and mow the vineyards, spread compost, spray compost tea and harvest the grapes. Louis – can you guess who he is named after? He still has two farm tractors and one is used in the cellar. The tractors are only used in the vineyard when it’s too windy for the horses to spray the vineyards. Yes, this is a seriously windy site. Cows and sheep on the farm provide essential resources. The herd of sheep we saw as we were driving up to Waterkloof was heading out to graze in the vineyards. The herd is moved around the various vineyard blocks to graze the ground cover. Their droppings fertilize the vineyard and their hooves break up the soil. Woody plant material is collected from all over the farm. Several times a week the farm receives milk whey from the cheese-making process at Healey’s Cheese, which is also owned by Paul Boutinot. This liquid is rich in lactobacilli, not to mention phosphorous and potassium, and is sprayed on the woody material. Over time this partially decomposed mulch is used as bedding for the cows and sheep. The woody material binds the nutrients in the animal’s urine. As the bedding becomes soiled it is removed from the barn. The mixture is turned and layered with compostable material and ash from the restaurant. Even pigeon droppings cleaned from the gutters of the winery building go into the mix along with droppings from the rabbit cages. “That’s the thing about biodynamics, you just use whatever you have.” said Christiaan. No resource on the farm goes to waste. All of this material is added together and turned regularly. We saw and smelled the cow and sheep barns. Stinky, as you would expect, thanks to the manure and the anaerobic environment. Next, Christiaan showed us a pile of bedding that had been removed from the stable the week before. It contained the additional compostable materials and had already been turned, and though we didn’t dig through it, it had a distinctly mushroomy aroma. The final compost, which included no soil, smelled just like dirt. There was absolutely no ammonia odor, and the dark, aerobic mixture was alive with earthworms – an indication of superior compost according to Christiaan. In addition to having a high nutrient content, the compost is alive with beneficial bacteria and fungi. Quite a transformation, one that can take from 22 to 50 days to complete. Earthworm casts, in addition to creating a superior composting product, are used to make a tea which aids in the transformation of the anaerobic manure mixture into an aerobic high-nutrient fertilizer. Bio-fertilizer is also made using cow and rabbit manure, milk whey, molasses, rumen and basalt rock added to water. “Whatever I can put my hands on, basically.” is how Christiaan described the ingredients. The mixture is then fermented anaerobically in a barrel for several months. At the end of the process the anaerobic mixture is combined with the aerobic earthworm tea which transforms the mixture to an aerobic, high nutrient fertilizer. Using all of these methods, Christiaan is able to make all of the compost and compost teas needed to enrich the soil and vines on the farm. Biodynamic preparations amplify the benefits of these organic farming methods. 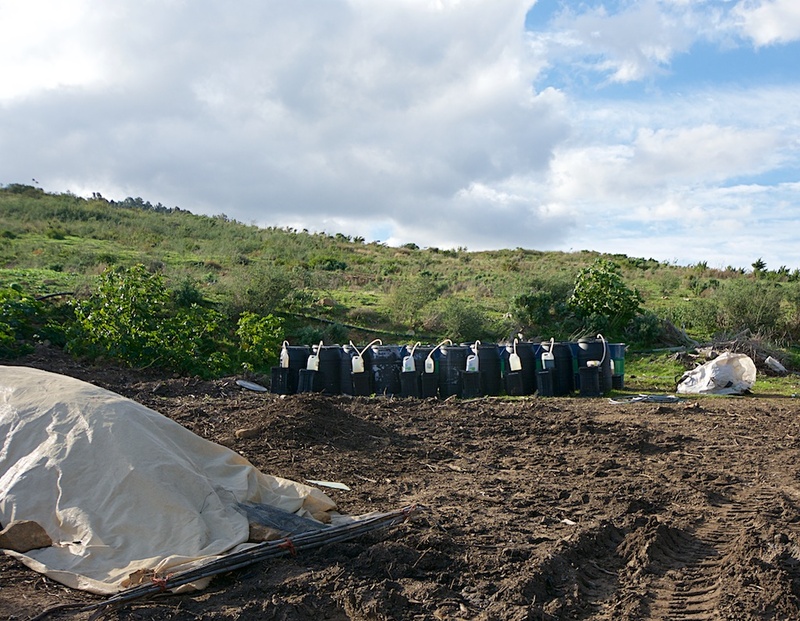 Christian maintains a cow pat pit along with a myriad of biodynamic preparations, all of which have specific uses. This is the part that doubters of the biodynamic process sometimes make light of. Admittedly filling a cow horn with the manure of a lactating cow, burying it over winter, then harvesting the preparation is a bit out there. But this preparation, called preparation 500, has a very high microbial count and adds vitality and life forces wherever it is used. In addition to being used to aid in compost production, a very dilute mixture of these preparations sprayed on a biodynamically managed vineyard will break down any organic material in the vineyard. The concepts of vitality and life forces are also a part of biodynamic principles. 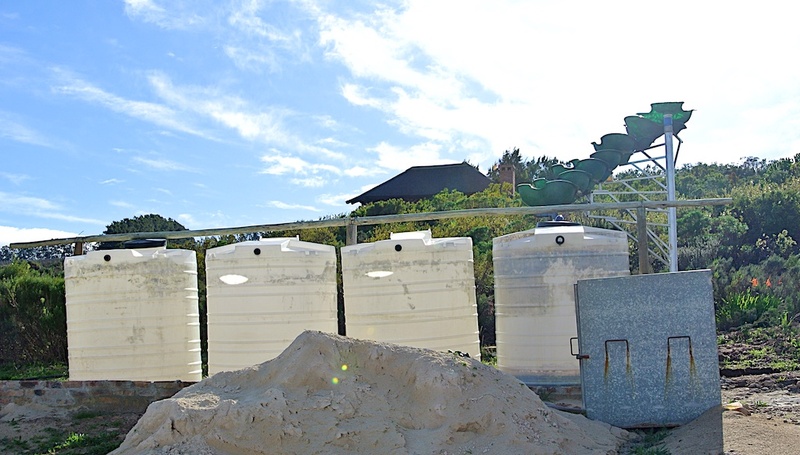 Christiaan explained the importance of the energy that can be harnessed from flowing water. Biodynamic preparations when added to water can be enlivened by manually stirring the liquid to create a vortex, then breaking the vortex and creating chaos in the water. In addition to oxygenating the water, life forces and energy are added from the flowing water. Therefore, biodynamic practices use the energy created by running water and harness that energy to enliven every liquid biodynamic preparation that is made before spraying it on crops. Rather than do this by hand, Christiaan has set up a flow form which allows him to enliven a large volume of liquid biodynamic preparation at one time. Fortunately, there is a natural spring on the farm, which is the source of the water used to make the biodynamic preparations and teas. Christiaan told us the farm’s name, Waterkloof, means water valley describing both the spring and the ravine that runs through the farm. Christiaan always applies biodynamic preparation 500 to the vineyards according to the phase of the moon and the moon’s relationship to the constellations. We are all familiar with the effects of the lunar cycle on tides, for instance. The lunar cycle has a similar effect on plants too. Sprays are always applied on a descending moon when the forces pull toward the center of the earth. This helps pull the microorganisms into the earth so they can facilitate the release of nutrients to the vines’ roots. Other vineyard tasks are completed according to the moon and constellations as well. Christiaan always sows cover crops during a descending moon to aid in germination. The timing is similar for vineyard pruning in order to minimize sap loss from the vines. The optimal time for harvesting is during an ascending moon when the pull is away from the earth; this concentrates flavors, sugar and tannins in the grape berries. Christiaan told us there is rarely a conflict between physiologic ripeness and proper moon phase for harvest but also indicated the timing is not absolute. Compost tea is spayed between the vineyard rows to facilitate decomposition of the vineyard cuttings during winter. A few months later, in September, the green compost (ground cover) may be plowed into the soil along with all of the microbes from the compost teas. After the vines leaf out the canopy is sprayed with compost tea, covering the leaves with microorganisms that will prevent mildew landing on the leaves from taking hold. Vineyard blocks are not plowed every year. Christiaan uses a combination of plowing, mowing and grazing to manage the cover crops. He has found that every other to every two years is the optimal interval for plowing. This allows the cover crop to produce sufficient roots to facilitate nitrogen uptake by the vines, but does not allow roots to grow too long and tenacious. Farming practices are rarely repeated in exactly the same way every year. Introducing variety in tilling and grazing routines changes the composition of cover crops, which in turn can disrupt pests. It’s best to keep pests off balance so they do not get a foothold. The principles of biodynamic farming were first outlined by Austrian writer and social activist Rudolf Steiner in the 1920s. Since that time many others from around the world have contributed to the knowledge and understanding of biodynamic practices; Eugenio Gras, Maria Thun and Peter Proctor are just a few of the names Christiaan mentioned as he explained biodynamic practices to us. After 10 years of following biodynamic practices in the vineyard, Christiaan is very close to repairing the effects conventional farming — he has achieved perhaps 70% of his goal. Even the soil in the vineyard blocks that were formerly covered with fynbos and invasive tree species needed rehabilitation. Over time, Chardonnay has been pulled out and Chenin Blanc, Mourvèdre and Syrah have been planted. Vineyard plantings have increased from 20 hectares to 56. Christiaan told us it is normal for vineyard yields to decrease initially with a conversion from conventional to organic farming practices. After about 3 years yields begin to increase. Though yields won’t reach pre-organic levels, the quality of the fruit is immaculate and may bring a higher price per ton, both of which more than make up for the reduced yield. As Waterkloof Wine Estate celebrates their 10th anniversary with the 2015 vintage, they are also able to celebrate the significant achievement of Demeter Biodynamic Certification. Louis has told us the 2015 harvest shaped up quite nicely. The Waterkloof vineyards experienced very early flowering and a cool growing season. Harvest began early and resulted in “quite an intense harvest with everything ripening one after the other and no time for us to breathe.” as Louis put it. Merlot and Cabernet Franc were the first to be harvested, followed by Cabernet Sauvignon and the Rhone varieties. He anticipates “wines with lots of complexity, lovely acidity and quite low alcohol (12.5 – 13.5 ABV).” I can hardly wait. A huge thanks to Louis for that original comment on our blog post. Without that, we would never have had the opportunity to meet Christiaan and learn about the biodynamic farming practices at Waterkloof. Many thanks to Christiaan for his time and enthusiasm; surely there is no better ambassador for biodynamic farming principles. Talking to a biodynamic farmer is the absolute best way to learn about the practices. If you ever have the opportunity, take it. It really could not have been a more perfect day.